The latest Ark: Survival Evolved update brings with it a fun new way to traverse the environment. 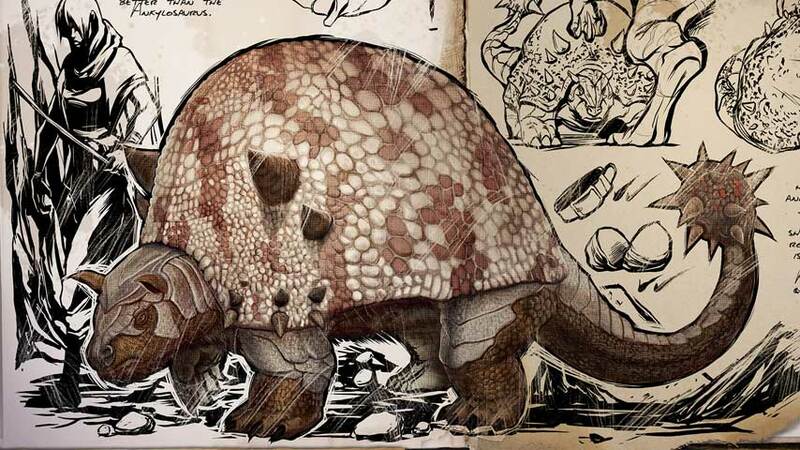 According to the latest Steam Community post, the newly-added Doedicurus Custosaxum is a non-aggressive herbivore, generally found on mountains and grasslands. Although it can use its spiked tail to inflict heavy damage, it usually prefers to retreat inside its shell in case of attack. Should you capture one and ride it, you can enter “shell-charge” mode. This allows you to “roll through the Ark as a hardened, nearly indestructible ball, similar to a certain blue rodent”, apparently. Not only does this get you up in your enemies’ faces faster, it also allows you to knock them down like a bowling ball. Nice. See it in action in the video below. The patch also added a spray painting gun, and the Plant Species X crop, which serves as a home base defence. Additionally, the Terror Bird dossier has been released. Hmm!